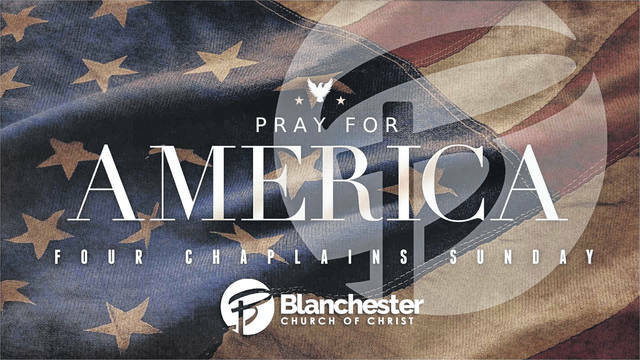 BLANCHESTER — The Four Chaplains Service this Sunday, Feb. 3 at 10:30 a.m. at Blanchester Church of Christ will remember and honor those who perished in the sinking of the USS Dorchester by a German U-boat in the North Atlantic Ocean on Feb. 3, 1943. Among the 672 who perished were four chaplains. Many of the survivors credited the chaplains for their leadership in saving others and for sacrificing their own lives. The Dorchester sank into the Atlantic in under 20 minutes. “Witnesses of that terrible night remember hearing the four men offer prayers for the dying and encouragement for those who would live,” said Wyatt R. Fox. The Distinguished Service Cross and Purple Heart were awarded posthumously to the four chaplains’ family members on Dec. 19, 1944. In 1948, Congress designated Feb. 3 as Four Chaplains Day. Active military and veterans’ groups, such as the American Legion James E. Marshall Post 187, and others have observed Four Chaplains Day annually since then. BCC will be providing a “Thank you” luncheon after services for our Boy Scouts, American Legion and Auxiliary members who participate and or worship with us. For more information, contact Minister Paul Casteel at 513-900-8972. Blanchester Church of Christ is at 911 Cherry St.